I noticed it, that the presentations and workshops I was attending at ISTE this week were more effectively delivered, compelling, and entertaining than I remember from past conferences. I assumed that it was because of luck — I happened to be in the right place at the right time. But then I started hearing the same thing from other attendees, that the sessions they were attending were better than they’d experienced before. So, having thought a bit about it, I’d like to speculate on some possible reasons. Mind you, these are only speculations. Luck – This is certainly a possibility (or probability), that I was talking with folks who were, like me, ISTE-charmed, draw to those presentations and presenters that fulfilled and exceeded their conference expectations. Presenters are simply better – Frankly, most of the sessions that I attended were presented by people who were accustomed to presenting at conferences. But I heard more than once about renowned speakers who had simply improved substantially over the past year. What I do at conference, I would have to consider to be a craft. I work to refine and improve my craft as I’m sure all of us do. Presenters getting smarter – I suspect that this might be one of the weightier potential reasons — and it is not that we’re increasing our brain mass and capacity. But I suspect that as we increase and refine our skills at cultivating and learning from our networks, we are collecting and contextualizing more ideas, opportunities, and resources more effectively and efficiently than ever before. Presentation software is Better – Here’s another one that comes from my own experience. Prezi, the single canvas, zoom, and twirl presentation software from Hungary, significantly effected my presentations in several positive ways. For one, it altered the way that I planned my presentations, as I was working with one document rather than many. Since switching back to Apple Keynote, I’m back to slide decks. But the astounding build and transition capabilities of this software has given me a richer tool box for expressing complex ideas with motion and sequence. I hope that I’m doing that well. The message is better – We seem to be talking less about test-prep and a lot more about exciting new pedagogies. We may even be talking less about gadgets and more about their application. I would love to see or do some research on presentation descriptions and their inclusion of various flag words to test this out. Again, these are merely speculations — food for thought. But I think it is a legitimate question for us to be asking right now, right after ISTE 2011. Are we beginning to mature as a movement? ..and if so, how and where do we go from here? 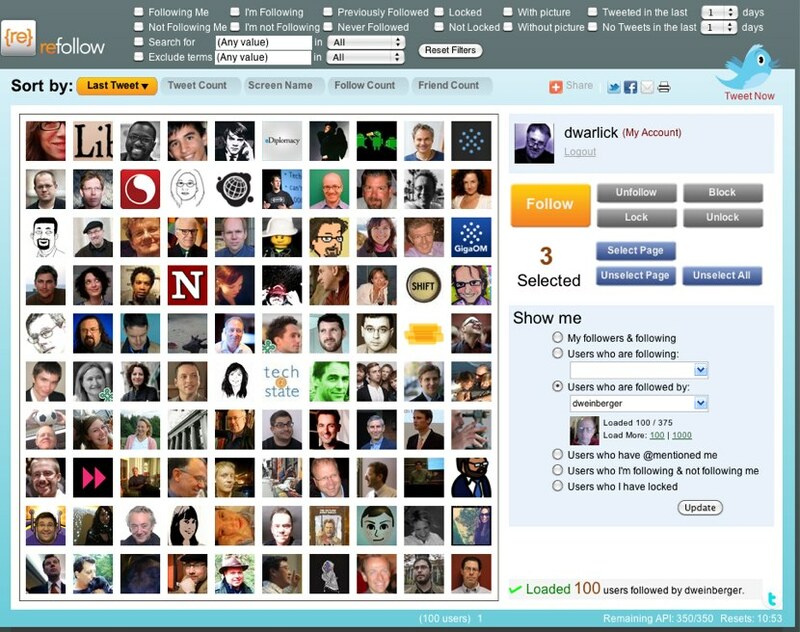 Author David WarlickPosted on June 30, 2011 July 1, 2011 Categories conferences, education, learning, teaching, technologyTags conference, iste, iste11, presentations, presenters, warlick3 Comments on Where is This Coming From? Why would you Build a Classroom? I’m at ISTE, and haven’t had time to do anything but listen, talk, do a little eating and sleep. No time to write or even think. I am just wow’ed by the ideas from EduBloggerCon, the opening keynote and some of the outstanding session presentations I’ve — and there are such powerful presenters here. I was especially impressed by Heidi Hayes Jacobs. She has contributed so much through her writings — but folks who write influentially often are not very good presenters. This is certainly not true for Jacobs, and I hope to write a blog post about here presentation. At this moment, I want to mention a couple of things about the opening keynote speaker. 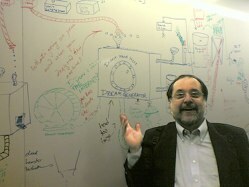 John Medina, author of Brain Rules, is a biological engineer. Again, I wasn’t expecting much, and was especially frustrated by the cramped conditions of where I was sitting and the Amazonian woman I was sitting behind, blocking out most of the light of day. I’ve become so spoiled by stadium seating in movie theaters. 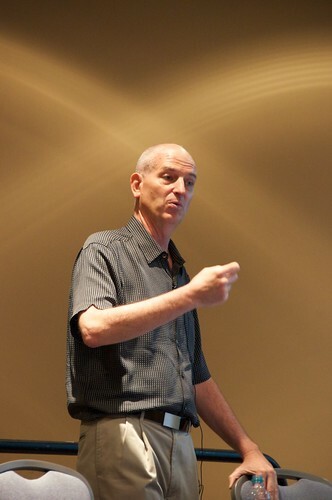 Author David WarlickPosted on June 28, 2011 July 1, 2011 Categories conferences, education, learning, teachingTags conference, iste116 Comments on Why would you Build a Classroom? Several days ago I submitted a proposal for an EduBloggerCon unconference session asking how social media and social networking might help to define digital (next) textbooks. To help seed this conversation I asked folks, via Twitter, from the train on Friday, to share some defining characteristics of old paper printed textbooks. As the responses flew in, I combined and edited them into more positive descriptions such as standards aligned, focused, unbiased, durable, etc. This morning I culled through the responses, mixing, matching, and editing them together into a defining set of comparisons. Admittedly, this listing reflects my own biased sense of where textbooks are going. • Old textbooks are STANDARDS-ALIGNED. Next textbooks will be synaptically aligned to the learning needs and experiences of their users. • Old textbooks are CENTRALLY-AUTHORITATIVE. Next textbooks will establish authority as part of the learning practice. • Old textbooks are SAFE & COMFORTING. Next textbooks will demand and provoke new learning (and teaching) through surprise. • Old texbooks are STABLE. Next textbooks will be fluid, dynamic and ever adapting to learning experiences and shifts in the world, about which we are learning. • Old textbooks are ERRORLESS (error ignorning). Next textbooks will admit errors and will socially self-correct. • Old textbooks are NARROWLY FOCUSED. Next textbooks will be broadly focused through logical and interdisciplinary connections and by adapting to the behaviors of their users. • Old textbooks are UNBIASED (self-proclaimed). Next textbooks will admit their multi-bias, and will invite and share reader interpretation. • Old textbooks are PERSONAL/ASOCIAL. Next textbooks will invite and facilitate conversation and, in appropriate ways, adapt and grow through the conversational behaviors of their users. • Old textbooks are MANUFACTURED. Next textbooks will be co-created, cultivated, and grown by learners and master-learners. • Old textbooks are DURABLE BY THEIR RESISTANCE TO CHANGE. Next textbooks are durable by their adapting flexibility. • Old textbooks are HEAVY. Next textbooks will weightlessly make themselves available to any learner, anywhere, anytime. • Old textbooks are VISIBLE. Next textbooks will glow, grow, and flow, seamlessly reflecting the world through the eyes of a learning community. The other day, I worked at the kickoff event for this year’s Ohio eTech ARRA Grant recipients. There were 16 schools represented by teams of teachers, tech coaches and facilitators, and administrators. The purpose was to introduce participants to some of the issues of tech-rich classrooms, and especially to start the conversations that will be the biggest part of their ongoing professional development. I especially enjoyed a panel session seating team members from past grant recipient schools. The panel discussion was held twice with two different moderators, so each session was quite different. Here are some items I noted and my two cents worth. The first question asked was, “What has surprised you?” An administrator said that the level of parent resistance was a huge surprise. I would agree that we should have every reason to expect parents to want the most up-to-date and innovative learning experience for their children. But the sad fact is that by the nature of schooling and the number of years that parents spent in their schools, there is a fairly irrepressible vision of what education should look like and textbooks are a pivotal part of that vision. The principal later said that they had not done a good enough job of communicating and when they finally held a thoroughly thought-out orientation, attitudes improved. Another surprise, that was nodded enthusiastically to, was the “Quality of work students could accomplish — especially those who were reluctant workers before.”. We all know stories of underachieving learners who take off when empowered with digital and network tools. This, alone, is probably the most compelling reason to me why nearly every aspect of formal learning should reflect today’s prevailing information landscape — networked, digital and abundant. We simply can’t afford to continue wasting the broader talents of our children. What surprised me was when one of the tech facilitators expressed surprise at the ease of transition exhibited by her teachers. It’s worth noting that the teachers involved in the grant project are all volunteers. Still, moving from stand and deliver high school teaching to learner driven education is a huge leap for anyone. A principal echoed these sentiments when he expressed surprise and pride in the professional growth in his teachers, especially in their enthusiasm for continued learning and the cohesiveness of the team. The “E” word came up often, engagement. One teacher said that “..even (her) lowest students, wanting to come back to the social studies classroom throughout the day.” I continue to struggle with what exactly this means, or what it looks like. Is simply wanting students to want to attend our classrooms the goal, or is it something deeper. If it’s deeper, then how do we describe that and accomplish it. Another commented that technology “leveled the playing field.” This is worthy of much more exploration. I want to ask, “Why?” I wonder, out loud, if modern information and communication technologies address and respond to a much broader range of literacy skills than paper-printed content. Another teacher said that her students were getting to know each other in new ways, Students get to know each other in a new way. “They actually know each other, because they’ve worked together.”. This strikes me as interesting, that students go to class to get to know each other. Quite the antithesis of the schooling that was done to me. 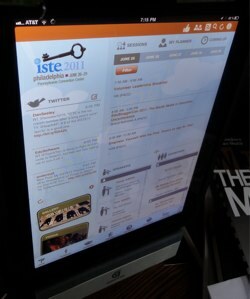 I’ve been saying to myself for weeks that ISTE 2011 needs an app. I wrote them and told them that the ISTE conference needs an app. They wrote back and said, “Working on it.” Couple of weeks ago I found the ISTE Mobile app, which, as a conference support tool is pretty pathetic, though, as an association reference tool, it’s a pretty good start. This afternoon, however, with a couple of hours in my office after flying in from Omaha and getting on the train for Philly in the morning, I did a search on AppShopper, and there it was, posted 17 hours ago, ISTE 2011 Onsite Mobile… (I’m guessing the dot dot dot extends to “App”). I haven’t looked at the iPhone version yet, but the iPad app is pretty awesome at first glance. It’s essentially a web page with all of the sliding windows that we’re accustomed to on our touch devices. 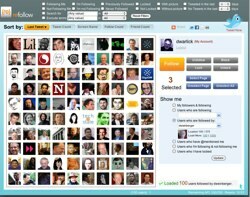 Starting with the upper left corner is a Twitter roll, featuring a post from techfish21, 6:08 PM (currently 6:36). 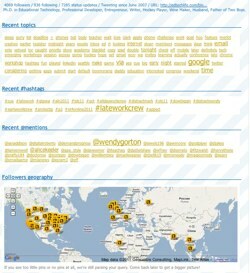 It only appears to display the latest feed’able 15 posts, which is a bit less than overwhelmingly useful. 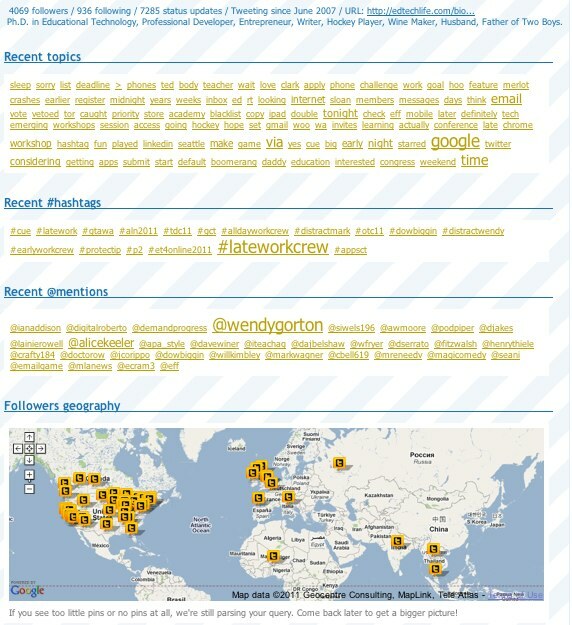 But we have other great ways to follow the conference buzz. Directly beneath is a slide’able alphabetical listing of presenters and exhibitors with popout details. The exhibitor details can click out into a map of the vendor hall. Now that could be handy. In the lower left are icons for “Gallery,” still empty, and “Videos,” broken down by day. Upper right menu bar features a thumbs up, to review the App on the iTunes App Store; two friends, which clicks out into an email message announcing the app that you can address to family and friends; a magnifying glass for searching;and the reload icon to get the latest content. There’s also an (i) for information icon with info on the company who made the app, quickmobile. On the bottom menu bar, and here’s where it gets interesting, is a maps icon. Touch it to get a floor plan of the exhibit hall, linked to details about the company. This seems less practical than it could be, because there are no titles in the map, so you’re clicking a booth number to see who’s at that booth. Maybe I’m just not thinking ahead enough. Further down the list are maps of the various levels of the Pennsylvania Convention Center, labeling lecture and session rooms, playgrounds, and lounges, posters sessions, etc. I’d like it if I could swipe through to the various levels, rather than having to back out to the menu. Also, I found that the maps loaded rather slowly. Perhaps that’s a first time thing. Overall, I think that this is a great beginning, and a tool that attempts and succeeds to an impressive degree, to create a one stop resource to cover conference attending functions that we’ll all be relying on a dizzying array of individual apps and web pages to work. Opps, the dot dot dot extends to Guide, not App. That’s my opinion — and by It I mean BOOKS. 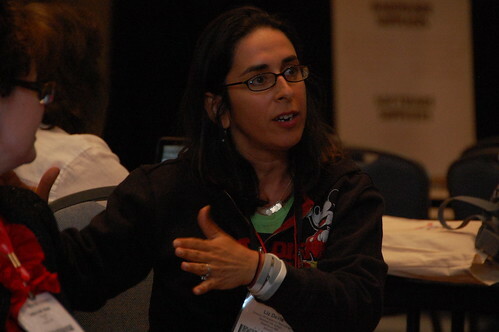 On Saturday, I’ll be attending EduBloggerCon in Philadelphia, where the sessions will be of an unconference style. This means that the expert will not he standing in front of the group. Instead, the expertise is expected to come from the group. The facilatator is tasked with generating the conversations that draw that expertise out while minimizing the venting that sometimes erupts. One issue that frequently comes up is their almost exclusive exposure our learners, in their native info experiences, have to short and independently focused media messages and the highly abbreviated messages that they share with each other. The concern is that millennials are not prepared and are disinclined to tough out longer stories or thoroughly explore deep and complex issues. I have run across research that seems to support these concerns – and I share them. When I think of my own experiences and my deep love of reading, the idea of the novel’s decline seems so incredibly unlikely that I fear it not even a little. I’m not an addictive personality, but I am addicted to stories. I love and crave long, deep, rich, wet, stories. I hate when they end. I particularly like series. At any time, I have two fictions going, one in audio and the other in print. It’s why I walk two to four miles a day, so I can pick up on my story. Before my Junior year of college, I prefered the pampering delivery of content and stories by network television. But in college, friends and more open-minded teachers introduced me to books that were not on standardized recommended reading list. I discovered the great stories of Arthur C.Clark, Robert Heinlein, Kurt Vonnegut, Herman Hesse, and many others and cannot think of a time since when I did not have at least one book with a bookmark in it. Now, what got me going down this path this morning (when I should be working on slide deck for ISTE) was my wife’s desire to have a way to easily record the books she is reading along with short personal reviews. I showed her a couple of library services, spending more time on Library Thing, my favorite. Then I started digging a little deeper — further procrastinating my upcoming presentation — and found their Zeitgeist page. It features the fifty largest libraries maintained by readers, fifty most prolific reviewers, twenty-five most reviewed books, seventy-five top authors, and much more — all based on the data generated by users’ use of the service. You can see of their vital statistics to the right. When I look at this, at the people who are not only reading, but wanting to share their reading — well I feel fairly secure in the continuing validity of the bookcases in our home. I’ve seen the question a number of times on Twitter, “What’s going to be the big ‘buzz’ at ISTE this year?” In the past, it has been blogging, podcasting, video games, MUVEs, and others. This year, well who knows. But to get a glance, I collected the text for all of the session, poster, and workshop descriptions and anayized them for key terms and phrases. It’s something that I do frequently, but this is the first time I have compared an upcoming conference with a past one — in this case, it’s ISTE 2011 with ISTE NECC 2008. 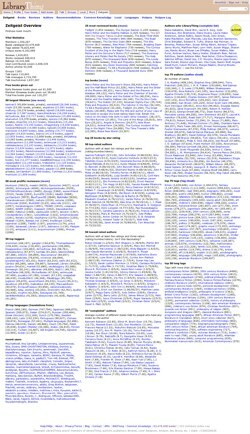 The attached file is a PDF that includes a word cloud of the most used terms in this year’s program descriptions, and a count of the occurrences of session descriptions with key words that I scanned for back in 2008. There is little that is scientific about this, but interesting, none the less. Another one that I was surprised not to see a lot of (and not entirely disappointed) was QR-Codes. In state and regional conferences I’ve been a part of recently, QR-Codes seem to have become something of the rage. Again, they’ve been around since 1995, but only recently have educators been testing out applications in classrooms and schools. I think they have a place in education, but there are logistical limitations, and do only one thing really well — they can turn a flat surface into a hyperlink for smart phone users. 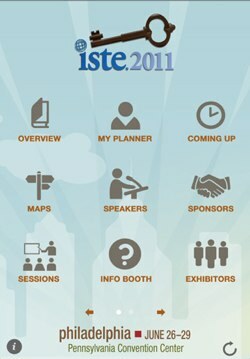 See you at ISTE 2011! I’m among the first to arrive at CityCamp Raleigh, a gathering of folks interested in technology and Gov2.0 (see GovFresh). I’ve heard of these things, and had some curiosity about it, and being a former state government employ and devote of the Web 2.0 conversation — well I’m here. The impression that I have, at this point, is that government 2.0 is about accomplishing a better civil existence through the richness of new conversations made possible by contemporary technologies. So I’ll sit for a bit, listen, and jot down ideas that cling to me. Until they start, they’ve got Neal Young and Cat Stevens playing through the speakers from someplace decades ago. I took notes during the two panel discussions (Government & Business Perspectives) on XMind, and that PDF file is available here. A couple of things did cling to me that I’d like to briefly post here, and I’ll mention that I was quite gratified by the amount of discussion about education that seemed to naturally emerge out of the Gov 2.0 conversation. Here is a link to the Twitter thread for CityCamp Raleigh. First, there was a story, told by Jimmy Goodmon, of WRAL. As a point of context, WRAL (Capital Broadcasting) is a local TV Station and an Internet pioneer. They where among the very first public ISPs in North Carolina, along with the Raleigh News & Observer (anyone remember Nando.net?). Goodmon has a son who is approaching school age, and he wanted to collect some data on schools that are available. He said, “So I got the files, and they were PDFs,” followed by a rift of laughter in the audience. But — and here is my point — how many of this year’s graduating high school seniors would get that joke? Here’s the problem. A PDF file is essentially a paper publication that’s printed on your computer screen. You can read it and it looks just like the paper-printed version. There are important advantages to this type of file, but the drawback that nicked the audience’s funny bone is that you can do very little with the information. It can be searched. But you can’t sort or filter the school data by any particular criteria. You can just read it, but you can’t work it. The preferred file format would be XLS or CSV, both of which can easily be imported into MicroSoft Excel and other spreadsheet programs. From here, the data can be analyzed deeply, the best schools surfacing to the top and the more worrisome schools sinking to the bottom. This conference is largely about data, and how, with free access to workable public data, citizens can understand, discuss, and ultimately improve their civil environment be generating new solutions to local problems. But this requires an understand of data and how to use it as a raw material. I’ve written before that all of this talk about data driven decision making is good. But I think it would be better if it actually became a part of what we help children learn. So again, how many graduating seniors know what they can do with a CSV file? How many Wake County teachers understand that knowing this is important? The other point that I’d like to share was actually a personal thread of thought that went through my mind during one of the panels. It’s about open source. I am by no means an expert on open source. But we, in education, tend to light-up when we hear about open source software, because we learn that it’s free. But what makes a piece of software open source is not that it’s free, it’s that it is free to be improved. What does a local government look like that is free to be improved? What does a school look like that’s free to be improved?